What's trending now in your garden? Garden trends change over time, and new and exciting ways to enjoy your garden emerge every year. Keeping your eyes open for the next idea is where it gets interesting. Trendspotting for the garden is one way to see if you’re on track with your garden design ideas, or way out there - so far, I've been lucky enough to hit trends right at the beginning - is this a case of "great minds think alike"? Trends are not the same thing as fads or fashions in gardening; they're more a changing mindset, or as some like to call it, a new paradigm. This new way of thinking is leading garden designers, landscapers and homeowners to view their gardens more as a habitat for everyone (including small creatures, birds and insects) and less about controlling and annihilating any species that are destructive, or unwanted, as these may be what draws birds and predatory insects near. 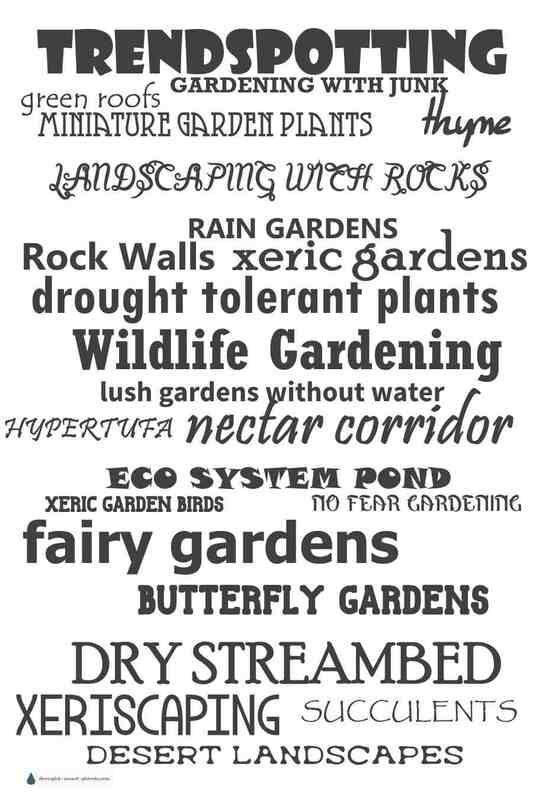 The fascination with observing the life cycles of our xeric garden wildlife is what makes these new garden trends so exciting. Wildlife gardening to entice the little creatures closer for you to observe is one of the most interesting benefits of this new mindset. ...could be the same as yours, or completely different. 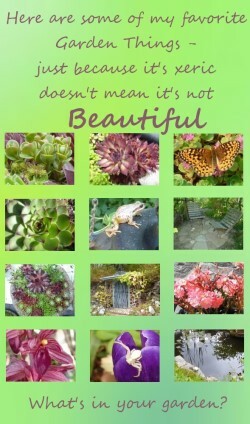 What is it about your garden that charms and delights you? Vertical gardening – whether you want to make a full scale green wall, or just use your back fence to grow squash up, you’re into vertical gardening. The main things to remember are that your structure must be strong enough to hold wet soil, plants and the containers that hold them, and keep in mind access to deadhead, fertilize and prune. If you use the next trend in the list for your living wall, you’re laughing. Succulents - I’ve been obsessed with succulents for years, and I’m always amazed at the new and unique ways people have to display and grow them. Their lack of concern for irrigation, and the way they shrug off heat, drought and lack of care make them my first choice for challenging conditions. Gardeners are finding intriguing ways to display them in succulent mosaics, spheres and topiaries. See the Succulent Wedding Gallery for one of the hottest trends in bridal fashion to come along in decades. Ornamental grasses have been big for most of this decade, and show no signs of losing favor with many landscapers and designers. Their upright growth and the rustling sounds they make when the wind blows are two main reasons they remain so popular. They’re also easy to take care of, which doesn’t hurt in these days of low maintenance landscaping. Make sure you leave the stems over winter to capture snow, and to give chrysalises and pupa of beneficial insects a safe place to over winter. Small space gardening, whether it’s growing some vegetables or brightly coloured annuals in containers, or courtyard landscaping, seems to be bigger than ever. Display some terracotta pots with succulent plants trailing over the edges in the warm enclosed area near your doorway to add a welcome touch with texture and colour as well as ease of maintenance. For the ultimate small scale garden, how about a miniature garden? This trend is so much fun; tiny shrubs, trees and even furniture, trellises, patios, pools and everything you would expect to see in your regular sized garden are here in miniature. Recycled and rustic planters for displaying all your favorite plants adds a fun dimension to your outdoor living area. Sick of your old plastic plant pots? 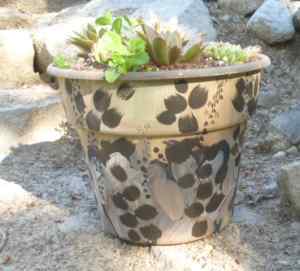 Paint them in camouflage and fanciful, whimsical designs to fit your garden style. A collection of shells from far off lands planted with tiny orchids, tin cans hung on a wall filled with Sedum, or hand-hewn hypertufa pinch pots topped with moss are all cheap but oh, so effective. 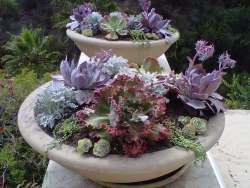 The use of rustic containers for succulents is one trend that seems to only be gaining in popularity. Rain water collection is front and foremost on every conscientious gardeners mind these days. A cistern or rain barrel to be filled when the weather blesses us with a rain shower can mean the difference between a lush garden and a desert. And last but not least, the biggest gardening trend for 2015 is xeriscaping – the art of growing a fabulous lush garden with little to no additional water. How does Xeriscaping work? Finding the right plants, using landscaping techniques that hold the moisture in the soil, and careful placement of plants in groups according to their needs are the primary strategies of this innovative gardening technique. What's Trending in your garden?